Futurama premieres for it’s seventh and final season on Comedy Central tonight with back-to-back episodes, “2D Blacktop” and “Fry and Leela’s Big Fling.” While the show’s future may be in doubt, tonight’s two episodes show that Futurama is still on it’s game and remains one of TV’s most imaginative and entertaining animated series. 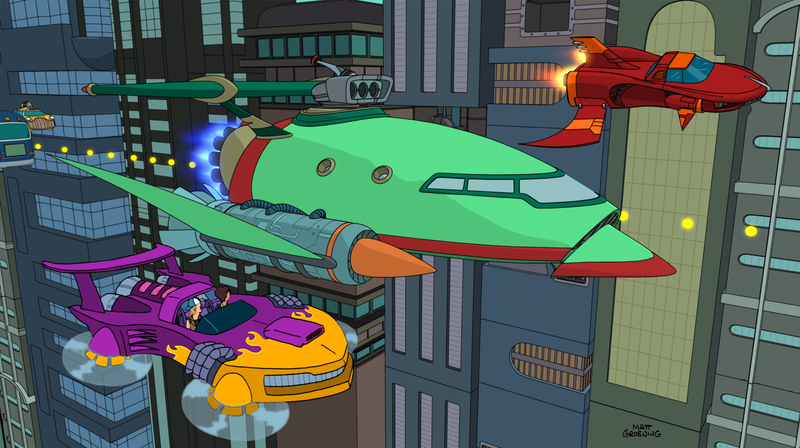 The season opens with “2D Blacktop,” a Fast and Furious parody that finds Professor Farnsworth taking up with a hip, urban race crew and then inadvertently landing himself, Leela, Fry, and Bender in a 2D parallel universe when his “dimensional drift” technique goes awry. After the Planet Express ship’s lack of safety features leads to a crash, Leela orders a new, safer ship, sending the old one to the junkyard. Unable to let go, Farnsworth salvages the ship and uses junk parts to turn it into a souped-up street racer, complete with a wormhole creating device to give it an extra edge. While Farnsworth’s busy with his new crew of “multicultural punks (who) just rap and tinker all day long,” Leela’s “nafety for safety” and uber-safe new ship are quickly turning her into a soccer mom, slowly and cautiously running errands and shuttling Bender and Fry to karate class. Eventually, Farnsworth and Leela have a run-in on the road and challenge each other to a race, where the dimensional drift leads to a head-on crash that sends half of the Planet Express crew to the 2nd dimension. If the plot of “2D Blacktop” sounds like its a bit all over the place, that’s because it pretty much is. The episode draws a lot of its humor from the contrast between the fogey-ish Farnsworth and his hip new friends (I enjoyed the running joke about Minx’s tragically normal relationship with her father and his “unspoken verbal abuse”) and from Leela’s turn towards the lame thanks to her boring new ship, complete with arm restraints and a padded dashboard. Visually, the show is as stunning as always and the sight gag of the Planet Express crew’s blind voyage to a technicolor, giant rainbow star shows just how lovely the series’ animation remains. Similarly, the 2D universe the crew gets trapped in – a cross between hieroglyphics and a child’s flat sketches – is equally striking (loved Bender’s visible stolen candelabra, too). While solidly funny at times, ultimately “2D Blacktop” falls victim to an arbitrary, “Farnsworth explains some science mumbo jumbo” deus ex machina ending that gave the whole episode a random, uneven vibe. The evening’s second episode, “Fry and Leela’s Big Fling,” in which the on-again, off-again couple set out for a private, romantic vacation that isn’t exactly as advertised, fares much better and can hold its own with some of the series’ classic episodes. 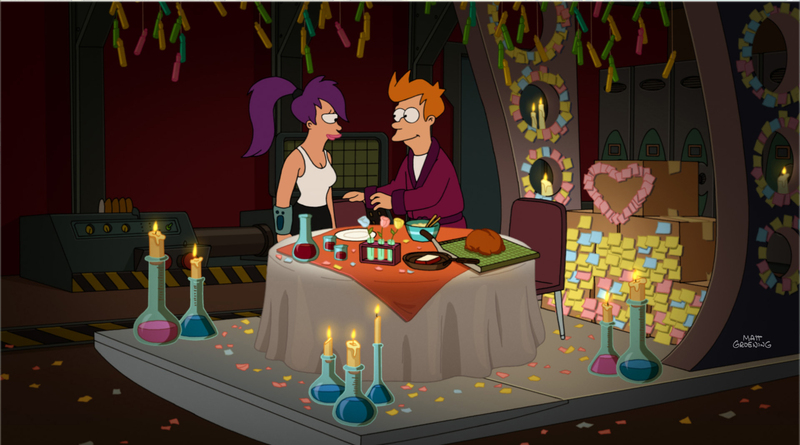 Unlike some other TV couples who’ve gotten together after years of unrequited love, Fry and Leela’s relationship generally seems to work and doesn’t represent a shark-jumping moment. The characters’ natures (Fry – dumb, easy-going, and sweet. Leela – strong, sensitive, and uptight) are simultaneously opposing and complimentary, and their genuine affection and constant bickering make them a believable and likeable couple. After having difficulty getting some privacy (Zoidberg the busboy was priceless), the two escape to a secluded, one-couple-only island for a romantic getaway. Unfortunately, due to an overlap and a broken shuttle, Leela’s ex-boyfriend, Shawn, and his wife are at the resort at the same time, sending Fry in to a drunken fit of jealousy. Meanwhile, Bender, Zoidberg, and Amy (clad in marmoset pajamas) travel to Simian 7, an ape-only planet, where they discover the truth about Fry and Leela’s couples retreat. The laughs are pretty consistent in “Fry and Leela’s Big Fling,” from an inspired use of soul classic “Just the Two of Us,” to a fantastic sight gag featuring a pineapple lei, to a great post-credits Bender outburst that had me laughing out loud. The episode features some callbacks to past episodes (oh, hey Gunter!) 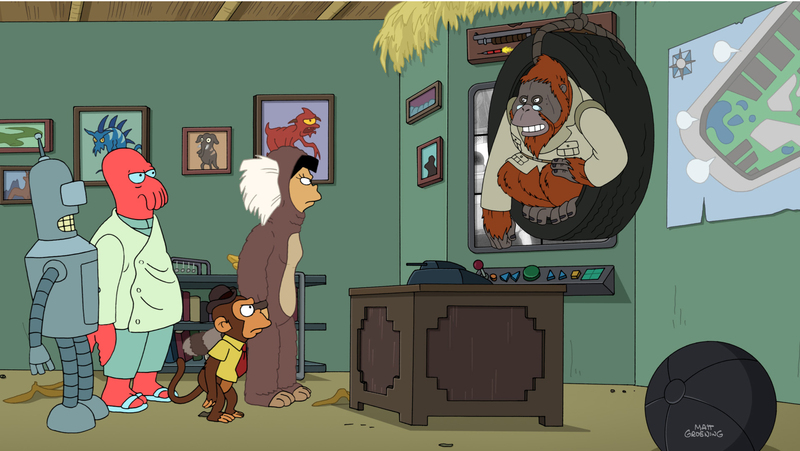 and some of the trademark Futurama silliness that gives the series its charm (the monkey business men going ape over their new office chairs was a nice touch). While the final batch of episodes may not succeed in saving Futurama, tonight’s two outings at least seem to point to a great, possibly classic final season. All Photos — Futurama TM and © 2013 Twentieth Century Fox Film Corporation. All Rights Reserved. « Holy Cybertron! : Machine Wars – What Were They Anyway?